Mumbai: The evening of 26 November was celebration time for Blackstone Advisers India Pvt. Ltd. The Indian arm of the US private equity (PE) firm, Blackstone Group Lp., had just closed its seventh deal in three years of operations, and chairman and managing director Akhil Gupta had planned dinner at Tiffin, the multi-cuisine restaurant at the Oberoi. Gupta was to take Kaul for dinner to Tiffin, where terrorists struck on the night of 26 November. Except that he had put on a lot of weight, and decided to invite him out for a quick, early drink instead. “We both left the bar right opposite the Tiffin at 8.45. Otherwise, we probably wouldn’t be alive to tell you the story," Gupta said. Minutes later, terrorists had struck at the Oberoi. The escape may have been due to good fortune, but more than luck went into building Blackstone’s Indian operation and taking it into overdrive. In the three years it has been in India, the firm has struck deals worth about $800 million (about Rs3,992 crore today), with two more in the works. Gupta is unaware how many employees the firm supports indirectly, and gets an aide to fetch the number. The answer pleases him: 101,951, in the same league as technology firms such as Tata Consultancy Services Ltd and Infosys Technologies Ltd.
Gokaldas Exports Ltd, in which Blackstone holds a 68.27% stake, has an employee base of 50,000; Intelenet Global Services Pvt. Ltd, the outsourcing firm where it owns a majority stake, has 28,000; and the CMS group employs 12,000. Employees at the other four companies Blackstone has invested in make up the reminder. On Blackstone’s future strategy, Gupta said there is more demand for private equity but the firm prefers to invest in privately held companies over listed ones. “We see more risk than we saw before, so our expected returns are higher. And also, there is much less competition from hedge funds and such. So we are seeing normal times in private equity where we expect significantly more returns, but at the same time, also able to create a lot of value." He said expectations have changed and private equity in India must compete for returns that are at par with the rest of the world. “It was about 20-25% before, now it is 25-30%. It is all risk-adjusted. Infrastructure risk is less, so we’ll try to get 20% return in an infrastructure project. Consumer companies’ risk is more, so then we looked at 25%, now it is about 30%," he said. As for listed companies, such as Nagarjuna Construction Co. Ltd, Allcargo Global Logistics Ltd and Gokaldas Exports, which have seen a sharp drop in share price since Blackstone’s investments, Gupta said he is not worried. “You guys always write about stock price, which may be completely diverse from the fundamentals. Today, three of our public companies are doing fabulously well. They are actually ahead of the plan, but the stock price doesn’t say that. And journalists won’t write that the companies are ahead of the plan. They will only write that the stock price is down," he said. He adds, however, that Blackstone is cautious about investing in public companies because of the mark-to-market risk. “But if we find a good opportunity because we have a five-year horizon, we are perfectly capable of not worrying about the mark-to-market risk," he said. “Markets always overshoot and undershoot and we are not guided by that. We are focused on the fundamentals." An aggressive buyer during the last phase of the bull run on the stock exchange, Blackstone picked up a 9.34% stake in Nagarjuna Construction at Rs200.50 a share, with the option to convert 9.11 million warrants into equity shares at Rs225 a share. “Today, why do I have to pay Rs225 if I can buy at the current market price? No, I won’t pay Rs225," said Gupta, indicating that the firm will not exercise the option to buy shares at such levels. Shares of Nagarjuna closed at Rs60.10 on the National Stock Exchange on Wednesday. In fact, Allcargo was a similar deal where further disbursement of money by Blackstone was contingent on the company meeting operational parameters set by the PE firm. The company was set a target of Rs210 crore in Ebitda (earnings before interest, tax, depreciation and amortization) for calendar 2008 to be eligible to receive Rs1,284 per share if Blackstone were to convert its 1.51 million warrants into equity. Allcargo is on course to meeting the target with an Ebitda of Rs174 crore in the first nine months of 2008. “You’re right, Allcargo is doing very well. The price at which we can exercise that option has gone up from Rs925 to Rs1,250," said Gupta. “But if the stock is at Rs500 (closed Wednesday at Rs414.65), then I’d rather buy that stock in the market. And that’s why we have an option. It’s not an obligation. It’s our option. The whole purpose of taking those options is to reduce your risk. You lose that 10% or 20% money that you put upfront. But that’s about it. After losing that, it may still be cheaper for us to buy from the market. So we’ll deal with these situations when they arise. Right now there is no specific action that we’re contemplating. If I have to make a decision today, I’d rather buy from the market." He also waves aside any suggestion of having to explain to investors, given that share prices have plummeted. “We are proud of our portfolio," he said. “It is you who would look at the share price. We’ll not sell our investment today. We’ll sell our investments five years later. Why should I be worried about where the stock price is? What we should worry about is whether or not the company is performing well," he maintained, pointing out that investors look at Ebitda growth. “And we are doing beautifully. We are 20-40% ahead of our plan in all the three listed companies we have invested in." Meanwhile, there is talk in the market about Anand Jain, promoter of steel maker and infrastructure development firm Jai Corp. Ltd and a close associate of Reliance Industries Ltd (RIL) chairman Mukesh Ambani, picking up a 6.64% stake in Gokaldas Exports, and speculation that the Bangalore-based garment manufacturing firm that supplies to the likes of Wal-Mart Stores Inc. may be delisted by Blackstone and sold to RIL. Again Gupta insists the question is way off the mark. “Anand Jain bought it just when the deal was announced, long time back. And he bought it to make a quick buck. If you do your research, then your question is irrelevant," he said. Jain had initially picked up a stake in the June-September quarter of 2007 and increased it later. But what happens now with Jain having one foot in the door, and floating stock being minuscule? “We keep all our options open all the time. We are right now busy with this deal (CMS Computer), and we’re busy with two other deals. So we haven’t really thought about (delisting). The markets have to stabilize, and we don’t know when that’s going to happen," Gupta said. As for Gokaldas, which will likely face the brunt of the downturn in western economies, Gupta believes the company is on safe ground. “Obviously, we are affected by what’s happening globally," he says. “Given that there is a meltdown of the consumer markets, our end markets are in serious trouble. But when end markets are in trouble, every customer has (an) A supplier, B supplier and C supplier. So they cut down the C suppliers. And they reduce the B suppliers. But they never touch the A suppliers. 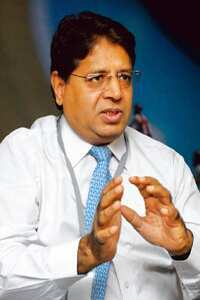 And fortunately, Gokaldas is an A supplier," Gupta adds.